The influenza Type A subtype H3N2 virus, which is responsible for 97 percent of the 127 California clinically-confirmed flu deaths for the 2017-2018 flu season that began on Nov. 1, has been confirmed as a “cross-species virus.” The flu variant is believed to have originated in pigs in 2009, then spread to humans in 2011, and to dogs in 2015. For the first seven years of H3N2 influenza in humans, there was only one clinically confirmed flu death in the U.S., in 2012. But the current U.S. H3N2 pandemic has already killed over 1,000 adults and 53 children. The spreading outbreak is expected to last until at least August. Of the 969 positive clinical tests for H3N2 influenza in dogs since 2015, 233 were recorded in California. And for the 2017-2018 flue season, California is leading the nation with 206 clinically confirmed cases of dog flu. The California Department of Public Health (CDPH) tracks epidemic risks through 72 enrolled “Sentinel Providers” (physicians, nurse practitioners, and physician assistants) located in all 58 California counties. Any patients suffering a fever above 100° Fahrenheit and with a cough and/or sore throat are laboratory tested for influenza and pneumonia. Due to the lower risk of humans serving as cross-species hosts to infect animals, there is no Sentinel Provider system to alert the U.S. Centers for Disease Control for animal epidemics. 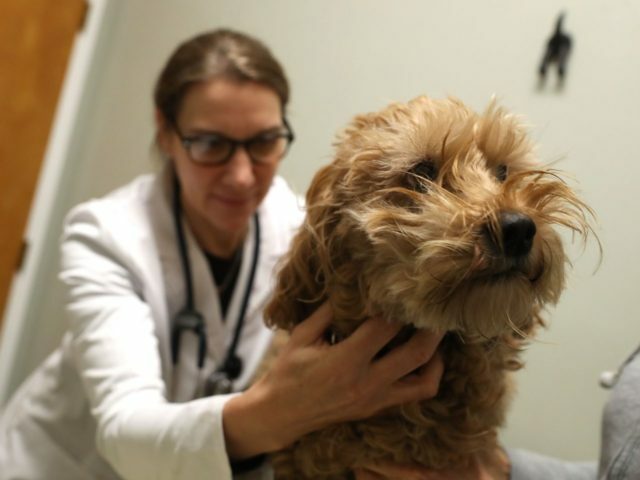 But Cornell University’s Animal Health Diagnostic Center is warning that its research demonstrates that flu in dogs is now entering a pandemic stage. The San Francisco SPCA put out an emergency warning late last week that it had confirmed a rising number of cases of “canine influenza” in the Bay Area. The SPCA is encouraging all dog owners to contact their veterinarians to seek vaccination. If their pets display flu-like symptoms of the virus, they should contact their veterinarians immediately. Cross-species virus transfers involve either increased area exposure or direct contact that allows the virus or bacteria to overcome immune system barriers to infection. Human virus transfers through contact to other species are extremely dangerous, because they usually involve amplification of the virus to overcome the new species’ immune defenses. Viruses such as H3N2, which have successfully mutated and crossed from humans to dogs, may become weaponized to cross back to humans more aggressively. There currently are no clinically documented cases of humans catching H3N2 influenza from their dogs, but such an event could lead to a much higher risk of pandemic death for humans.